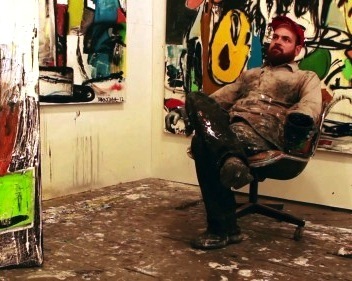 Eddie Martinez in his studio, Greenpoint, Brooklyn, 2012. Production still from the New York Close Up film, Eddie Martinez’s Risky Business. © Art21, Inc. 2013. Jonathan Munar posts a new video about painter Eddie Martinez. In the video Martinez discusses the desire to seek a new, abstract direction in his work, a desire that was realized in his recent exhibition, Matador, at Journal Gallery, Brooklyn. On changing from figurative to abstract painting Martinez says: "I really have to go into the paintings a little bit more to figure them out, to pull their potential out of them. Because I don't necessarily know what the imagery is and I don't know what the moves are going to be as readily as I did when painting a bouquet of flowers over and over and over again."